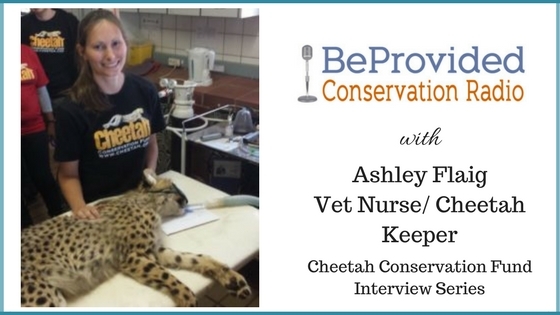 Today our special guest is Ashley Flaig a veterinary nurse and lead cheetah keeper at the Cheetah Conservation Fund in Namibia. I had the pleasure to interview Ashley during my visit as a working guest volunteer at CCF in February. I was honored to go out with her on some rounds to check on the cheetahs that will be released one day and feed and exercise the older cheetahs that cannot be released. Watching and helping her work, I could feel her passion and love for these beautiful cats. Ashley is from Florida and has been at CCF for almost 10 months now. Her love for nature and conservation started young when she became active in the Outdoor Recreational Center. She earned her Bachelors degree in Biology and a minor in Environmental policy. During her internships she developed a love and passion for wildlife and soon found herself working with big cats. During this time she met Charlie, her first cheetah love. After graduation she was hired as a lead feline keeper and intern coordinator at the Panther Ridge Conservation Center. This experience sparked her interest in zoological medicine and so she pursued her Veterinary Nursing certification and now here she is working with cheetahs at CCF.